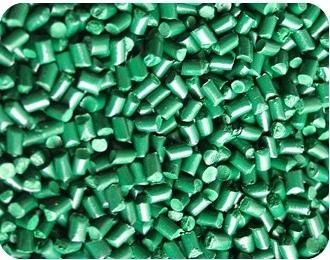 GREEN EF-G4615 is a green LDPE based masterbatch containing 30% pigment, designed for use in polyolefin resins (PE and PP, etc.). Color Index No. : Green 7. GREEN EF-G4615 is designed for ease of dispersion and is therefore suitable for direct addition and mixing with plastic resins in mixer, avoiding pollution and mal-scattering problems caused by pigment. GREEN EF-G4615 is designed for use in LDPE, HDPE, LLDPE and PP for production of premium high glossy films. GREEN EF-G4615 is supplied in regular pellet form packed in 25kg bags. It should be stored in a dry place.